My major knitting goal (I don't do resolutions!) for 2013 was to finish up some languishing projects, ones that have been sitting around for more than a year. I don't always remember why I set these aside. It wasn't because I no longer like the project because I love them as much today as when I started them. I think that the main reason was ADD. No, not the medical diagnosis. ADD is Another Darn Design. For a while I was seeing so many intriguing projects and I wanted to do them all. I gave into temptation and started some. For the rest, I would bookmark the pattern for later. I have lots of bookmarks. Since these would be considered major projects, I'd be very happy to finish 3 before the year is out. More than three....bonus! "Large Lace Collar" - a Bohus sweater. I have more completed than you see in this picture. 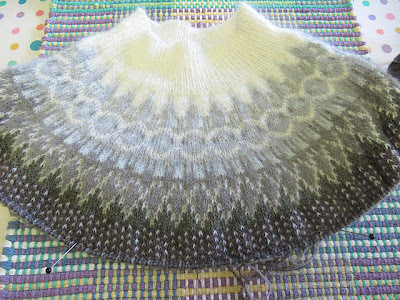 The rest of the sweater is only black, no colorwork, so that may be the reason I set this one aside. I'm very anxious to finish this as there are other gorgeous Bohus designs that I'd like to make in the future. 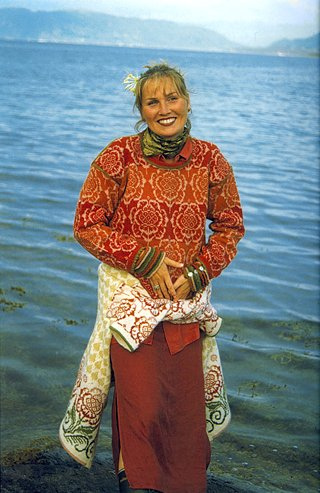 I worked on this project with a group of friends, each making her own favorite Bohus sweater. It was great to see so many Bohus designs "in person". So many temptations. 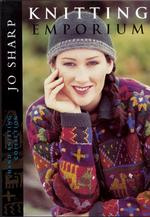 The cardigan you see on cover of Jo Sharp's book is called "Tashkent". I taught a class at A Knitted Peace on working intarsia and this sweater in particular. When the class was over, I set this sweater aside, can't remember why, maybe preparing for another class. I love all the colors and the design. This is "Whistler" by Dale of Norway and another sweater that I started for a class that I was teaching. The picture is one I found online. I don't have a photo of my unfinished sweater. I wanted to finish this in time for the Olympics in Vancouver, but obviously that didn't work out! 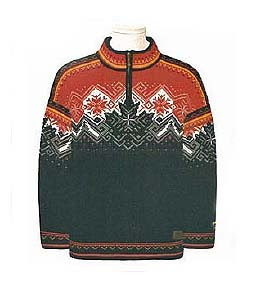 It's a good thing that my taste in sweaters hasn't changed over the years as I purchased the kit to make this at the TKGA conference in Branson, MO in 2007. Once again, I started it to teach a class. It's time I finished. I could have been wearing it all these years. I call it the "Orange Sweater" from Poetry in Stitches. This is the last project on my short list and I do remember why I set it aside - I was moving from Denver to Calgary. It's not exactly a carry-along project. 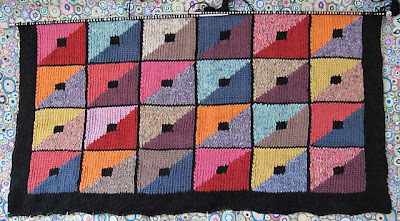 This is Kaffe Fassett's "Triangle Squares Cushion". The cushion is about 1/4 finished, as you see in the picture. This is what it looked like when I put it away. So, I have my to-do list. There are other projects that I want to complete but these are at the top of the list. When these are finished I'll start a whole new list. I'm still struggling with ADD!